My hernia repair operation was bigger than expected. I came home from hospital on Wednesday and have been resting since then. It's been a whole week since my last post and I want to say a Big Thank You for the many wonderful comments I received on here, they were most welcome! I haven't forgotten that I promised to show my sample cards that I made for Joanna Sheen's TV launch last weekend of the Tales of the Sea rubber stamp collection. I am delighted that so many of you enjoyed the turtle freebie last week, I hope I get to see what you make with it. 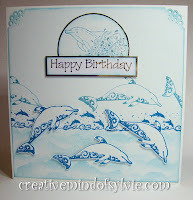 I used 12 of the stamps on this card! I started by inking an 8" x 8" piece of card with Tim Holtz broken china distress ink and then sprinkled water and dabbed the drops to create bubbles in the background. The netting on the base of the card is the net corner stamped across and embossed. I replaced the banner with the diver with the dolphin, stamped some of the shells and the crab and fish, coloured them in with promarkers. The star fish looks more 3D because I used an embossing tool to score lines and creased where the raised parts should be and stuck with a few layers of foam pads. I also scored the lines in the the other shells to add texture. Twisting two shades of green ribbon was a last minute idea that I think really worked well to look like seaweed Lol! I used my score board to create the planks of wood and then free scored the extra lines for the grain and then lightly rubbed ink to highlight it a bit.... Later I realised that the wood should have been going across the card.. never mind I think I got away with it Lol! I drew the circle port hole using a circular ruler and shaded with promarkers adding some silver nail heads for decoration. 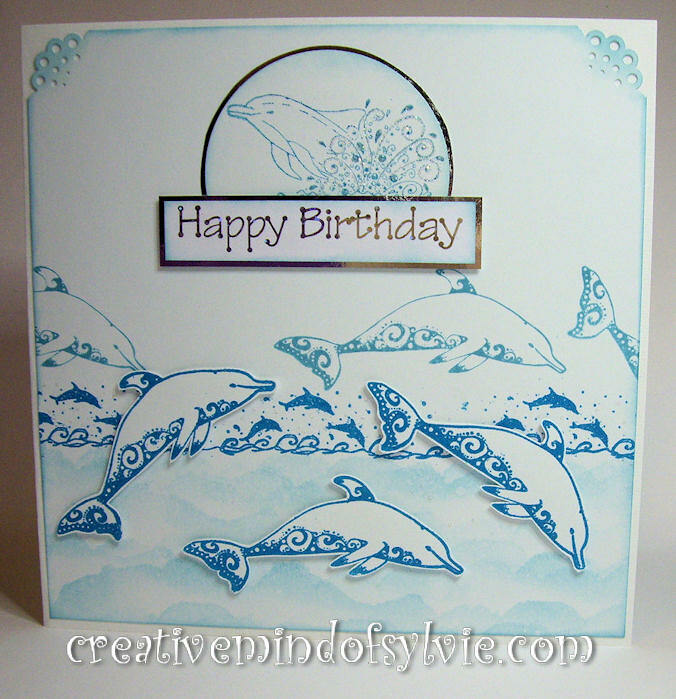 After stamping the diver and colouring her in, I inked the edges with blue... added the Happy Birthday into the banner. 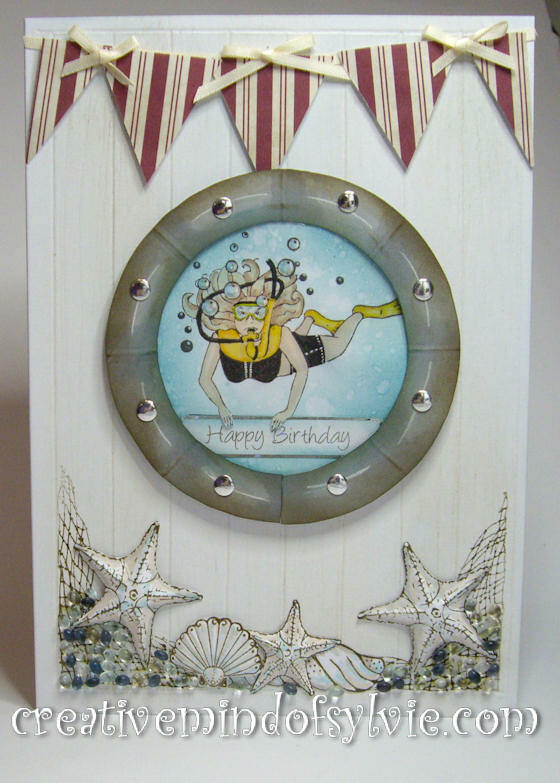 I finished by stamping the starfish and shells onto white card ,only adding pale colours to colour them.. 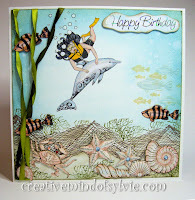 I stamped and embossed two net corners directly onto the card - I scored the shells again stuck them down with foam tape and added some lovely little pebbles from my stash that I had been in a gift set packaging from the body shop Lol! Thanks for visiting.... I will add 3 more cards tomorrow..
Glad you are on the mend! Great cards. Your cards are so pretty. The worst part is over. Now just relax, let your body mend and you will be back before you know it. Your attention to detail never ceases to amaze me. Those cards are lovely! Take your time and rest all you need to. I remember when my mom went through a similar operation, and it didn't look fun. Hope you're feeling more normal soon! Lovely cards! Hope you're feeling better soon. Hope you're feeling much better by now. Your attention to detail is amazing.